The bar and theater were empty save for me and Rick, the brightest lights in the room were the exit signs, and I had just listened to a brand new Danko song five times in a row. Each replay of “Driftin’ Away,” sounded better, especially with Rick’s live harmony. The sun was about to rise and I had a day of work ahead in the Bearsville office but Rick wanted to keeping playing tapes for me. He played, and then gave me, copies of a recent solo show he had done a Amherst College along with a writers-in-the-round tape with Syd Straw, Donnie Fritts and Guy Clark at NYC’s Bottom Line. He told me to keep his boom box recording of “Driftin’ Away,” he already knew it. I was on cloud nine, not just for the music but for the experience, I had just shared with a consummate musician, writer, artist and person. I had forgotten to inform Graham about Rick’s unique manner of communicating which would change with his desired substances or drink - but never failed to be entertaining and enlightening. 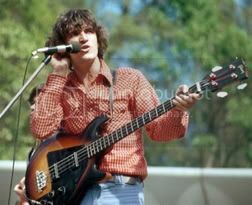 Graham was a longtime fan of The Band but his reaction to the extroverted, drastically overweight Rick Danko was the same as anyone who met him for the first time. Rick had one of those beautiful personalities that made people adjust quickly and love him as he is at the time, drunk, sober or stoned. The set lists planned by the star duo, I secured the theater for a rehearsal the night before the performance. Rick was late as usual but it gave me the chance to get to know Graham – another instant hero turned friend. As he pulled up to the theater door to unload his amp and two guitars, I insisted on carrying everything in for him. It was a brisk Catskill night and we chatted outside the theater. I made a joke about him being so nice by asking, “What happened to the angry young man?! !” He replied, “the angry young man is now a content old man. He may have been personally content with his lovely wife, Jolie, and their beautiful daughter on a farm in the Catskills but the new music he played during the rehearsal and the show the following night was anything but content. Graham was debuting songs from his next record, Burning Questions, and I was privileged to hear them first as it was only me and Graham in the theater, just like it was with Rick a few mornings before. Graham had ran through full versions of his past glories and practically the entire new record when Rick appeared. I had left the theater door ajar so he could come in as he pleased. Rick walked onstage with his Gibson acoustic guitar in hand and said his howdies to both me and Graham. As if he had known Graham for ages, he asked him about covers he would like to do for the encores. Rick did not need to rehearse his set – it was burned into his memory. They settled on the Walker Brothers, “The Sun Ain’t Gonna Shine Anymore” which Graham had covered on his previous LP. Rick taught Graham the guitar and harmony parts for “Driftin’ Away” and they decided on the perennial favorite, “I Shall Be Released” for the final song. The playing and trading stories lasted into the night until our wine buzz started to get the best of us. I only had a short walk to my house which was located on the Theater/Studio property but Graham and Rick insisted on driving home – they both lived only a couple of miles from the theater. Thank God, they made it home and got some rest because the performance was sheer energy by two well-heeled veterans from different continents. As the theater only held two hundred fifty seated and about one hundred in the bar, separated by glass for an inside view, the line for show tickets were long. Bard College was just in sessions so there was an abundance of clean cut but chain-smoking Muffy and Skip types along with the old-time music friends and fans of Rick and Graham. The show started promptly at 8:00 PM and, technically, we had an 11:00 PM curfew but when the show turned out to be bigger and better than any of us expected, it was just after midnight when the duo leads the packed audience and bar in the Dylan/Band classic. After the show, the Woodstock luminaries gathered backstage and someone pulled out a guitar, Rick and Graham and a host of others serenaded the crew and each other until Sally had us all rounded up and leaving the theater. I know it is a cliché but I knew every moment I was there was special even though it took a few years to know just how special it was. I have the rehearsal and show tapes to remind me how great those times were and I truly felt that if this was a dream, I don’t want to wake up.